One of the overarching goals of structural genomics is to characterize the structure and function of entire systems of proteins. This is particularly useful in the study of cancer, since the transformation of normal cells into cancer cells requires the coordinated corruption of many cellular systems, overcoming the many natural protections built into our cells. Researchers at the NESG are studying these connections in whole and in detail. 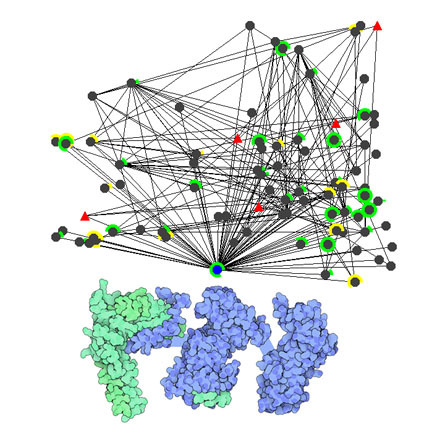 First, they have created the Human Cancer Protein Interaction Network (HCPIN), a resource that gathers data on proteins that are implicated in cancer and their interactions with one another. This network is populated with atomic structures when available and homology models when necessary. Then, NESG researchers have identified key targets in the network for further structural study in cases where no suitable structural information is available. By looking at the many interactions between these proteins, NESG researchers have identified important "hub" proteins, which interact with and control a large collection of other proteins. The retinoblastoma protein (Rb) is one of these hub proteins. It was the first tumor suppressor protein that was discovered, through genetic analysis of individuals who all suffered from a similar form of retinal cancer. As a hub protein, Rb plays a central role in controlling the growth of cells, by deciding when cells are allowed to divide. In cancer cells, Rb is often mutated to destroy its function, allowing the cancer cells to divide without limits. Rb binds to many of its partners using a specific pocket that recognizes the motif LxCxE. The central domain of Rb is included in this structure, shown here in blue, with a short peptide bound in this pocket, with the backbone in green and the leucine-cysteine-glutamate in atomic colors. Use the buttons to switch the representation, and to get a close-up view of the pocket. Rb is composed of several domains, each with a specific function, connected by flexible linkers. 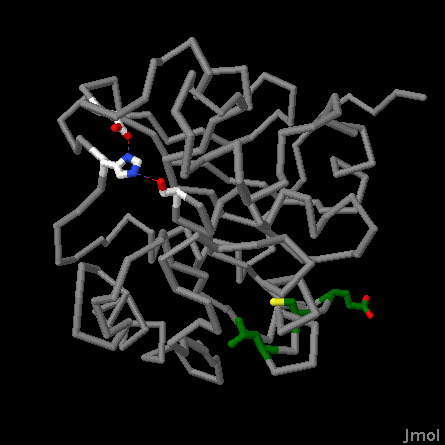 At the center is a distinctive "pocket" domain, seen here in PDB entry 1gux. It binds to the motif LxCxE, shown here in green, which is found in many of its interaction partners. The C-terminal domain binds to the transcription factor E2F, removing it from the genes involved in cell division. Rb is also controlled by phosphorylation: by adding phosphate groups to the protein, it can't bind to E2F and the genes that control cell division are expressed. RBBP9 binds to Rb and also has a serine protease active site. The distinctive LxCxE Rb-binding motif is colored green with the three sidechains in atomic colors. Notice that the leucine and cysteine are buried in the protein, so some rearrangement will probably be necessary when the RBBP9 binds to Rb. The catalytic triad in the active site, composed of a serine, histidine and aspartate, are also shown in atomic colors. Use the buttons to switch representations. As seen in the HCPIN, Rb interacts with many proteins, which together weigh many different signals reaching the cell to decide if it should divide or not. 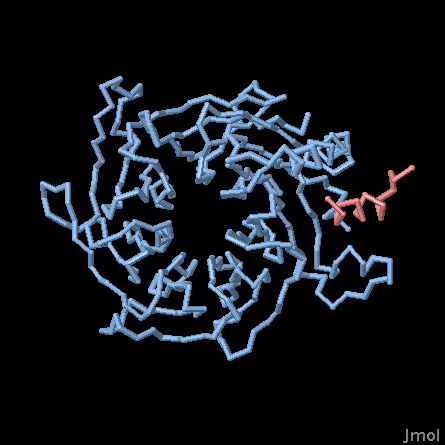 NESG researchers have solved the structure of one of these proteins, shown here from PDB entry 2qs9, identifying the LxCxE motif and also discovering a serine protease active site. Further study has revealed that RBBP9 is important in the connection between Rb and signals from TGF-beta. Surprisingly, the LxCxE motif is bound inside the protein in this crystallographic structure, so the protein must either rearrange a bit to interact with Rb, or interact through a previously unseen mechanism. The Rb-associated histone chaperone RBBP7, also known as RbAp46, is shown here in blue, and a short segment of histone H4 is shown in red. Use the buttons to switch representations. Rb, as a major hub of action, also has other functions that don't lead directly to control of the transcription factor E2F. This includes interactions with proteins that control the packaging of DNA into nucleosomes. RBBP7, also known as RbAp46, is an example included in the HCPIN network for Rb. It acts as a histone chaperone that guides the addition of acetyl group to histones. PDB entry 3cfs includes the protein with a small segment of histone H4. 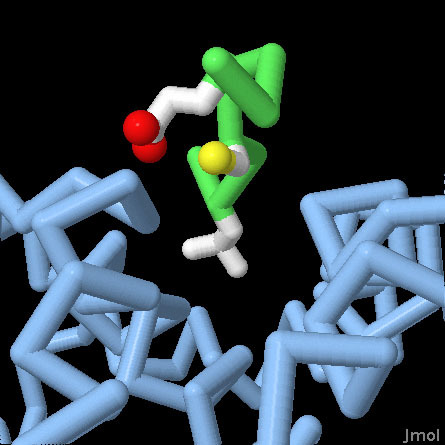 Researchers at NESG are currently targeting over a thousand proteins from the HCPIN for 3D structure determination. Structural genomics is a particularly effective method for this type of study: traditional approaches tend to focus only on the central players, however, structural genomics seeks to provide structures for the entire network, including the many proteins that link and intercommunicate between the central players. You can follow the progress of this study at the HCPIN website. Shields, D. S., et al. RBBP9: A tumor-associated serine hydrolase activity required for pancreatic neoplasia. Proc. Natl. Acad. Sci. USA 107, 2189-2194 (2010). Vorobiev, S. M., et al. Crystal structure of human retinoblastoma binding protein 9. Proteins 74, 526-529 (2009). Burkhart, D. L. & Sage, J. Cellular mechanisms of tumor suppression by the retinoblastoma gene. Nature Rev. Cancer 8, 671-682 (2008). Huang, Y. J., Hang, D., Lu, L. J., Tong, L., Gerstein, M. B. & Montelione, G. T. Targeting the Human Cancer Protein Interaction Network by structural genomics. Mol. Cell. Proteomics 7.10, 2048-2060 (2008). Murzina, N. V. et al. Structural basis for the recognition of histone H4 by the histone-chaperone RbAp46. Structure 16, 1077-1085 (2008). Le, J.-O., Russo, A. A. & Pavletich, N. P. Structure of the retinoblastoma tumor-suppressor pocket domain bound to a peptide from HPV E7. Nature 391, 859-865 (1998).